Alan Mishaga may be the most famous artist you’ve never heard of. If you aren’t one of thousands who’ve partied or snapped vacation selfies alongside his paintings, you’re one of hundreds of thousands who’ve seen them from Estero Boulevard while stalled in Fort Myers Beach traffic. 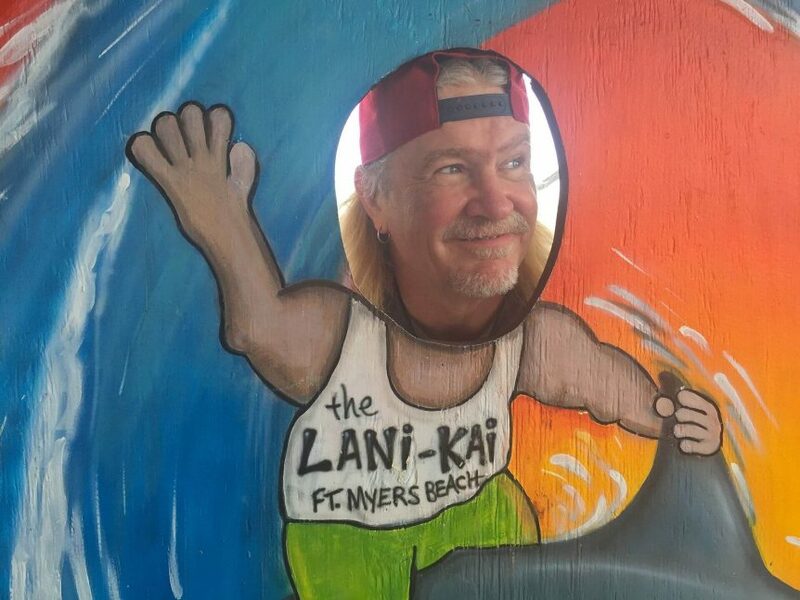 Mishaga is the man behind the murals of that spring break icon, the Lani Kai. A self-taught artist who migrated to the Beach from Ohio, he was making T-shirts in Times Square when the wife of a hotel staffer called one day, asking if he could paint a mural. “I was three quarters of the way through the job when they asked if I could do another section,” recalls Mishaga, an independent contractor. That was 1996, and he’s been painting at the hotel ever since. There are haters, to be sure. Many wish the Beach – and the Lani Kai — would get over their party hardy image and sober up. Like the woman who got her first tattoo and couldn’t resist another, today’s Lani Kai wears a body suit of Mishaga’s art. But it didn’t start that way. “It was just a basic-looking building,,” Mishaga describes the structure when he first arrived. Built around 1980, the hotel towered over its neighbors in size and personality. Owner Bob Conidaris had a penchant for creating the right backdrop for wild, fun times. Now 85, Conidaris still reports to work daily, sometimes in a vintage Cadillac convertible. Every nook and cranny of the hotel bears his touch and that of his late wife Grace, who passed away in 2008. “She was very vocal,” Mishaga recalls Grace Conidaris, who he credits with influencing the hotel’s Hawaiian name, meaning heaven by the sea. Like Renaissance patrons, the Conidarises told him what they wanted, and the artist obliged. For 20 years the artist has followed with a paintbrush and airbrush as the hotel went through additions, renovations and a re-build in 2004 after Hurricane Charley. As weather fades the art, he retouches it. It’s no longer about one-off murals. The Lani Kai is Mishaga’s canvas. When Hurricane Charley wiped out the hotel’s ground floor, Conidaris, who staff call Mr. C., built it back minimally. He let vendors occupy some concrete-walled concession spaces, and turned the open areas into themed bars and hangouts facing the beach. The nightclub was named Ohana, Hawaiian for family; a word important to the Conidarises. If you work at the Lani Kai, you are ohana. The nightclub is where you’ll find Mishaga’s masterpiece: a wood panel of music greats spanning the 20th and 21st Centuries, from Sinatra to John Lennon, Bob Marley, the Blues Brothers and Lady Gaga. Here, too, Mishaga painted some of the hotel’s family. On a south wall is Larry Puccia, memorialized in neon paint making pizza, which he used to do before becoming Lani Kai’s GM. When the black lights are on, Puccia glows. Guests having breakfast at the hotel’s Sabal Palm restaurant might notice a heart with ‘R.C. loves G.C.’ carved into one of the tree trunks by the north mirror. Mishaga has encoded Conidaris’s love for his wife throughout the hotel, nowhere more than in the Casablanca, a bar that opens and closes at the owner’s whim. Located on the lobby floor behind glass doors (Mishaga did the calligraphy, too), a black-and-white mural covers the wall behind the piano. Bogart and Bergman are depicted beside a piano in the film’s famous bar scene. Seated to the right are the Conidarises, painted from a photograph. They appear to be enjoying the music while a friend stands over them holding a slice of wedding cake. Mishaga’s personal favorite is the concrete housing for the elevator, rising to the top of the building. Evoking a Polynesian tiki, the base of the painting incorporates an elevator with a door and button. It’s a trompe l’oeil – the real elevator is on the other side – and it works. The News-Press photographer Andrew West captured people pressing the button before realizing it’s a fake. “It’s a good thing Bob has a sense of humor,” Mishaga says. For high-rise projects, the artist works from a rented motorized lift. He enjoys catching the ocean breezes from the heights, he says, but one day the motor died while he was at the top of the building. Not one for publicity, Mishaga was suddenly the center of attention as police cars, ladder trucks, a rescue squad and the media descended on the hotel parking lot. The mid-2000s brought new features to the Lani Kai. Conidaris added a portico for cars to deposit guests in inclement weather, and a waterfall in front for dramatic effect. Mishaga decorated them with Polynesian hula dancers under the roof and scenes of Southwest Florida wildlife outside. Hotel insiders will recognize one of the dancers as a hotel bartender, and on the south side, a whimsical sandwich hooked in a panther’s tail; a nod to hotel concessioner Mario’s Deli. Everything was coming together until the owner asked for something totally out of Lani Kai character — an American flag. “It was around the time of the Iraq War. Bob is very patriotic,” Mishaga says. The flag dominates the front-facing portico roof, a challenging surface made of corrugated tin, too high for the artist to step back and make sure it was coming out right. Mishaga, who honed his skills in Ohio detailing classic cars, is good enough to paint most murals free-style, working directly from idea to wall. For this one, he graphed the design, transferring his drawing from grid paper to the building and blocking it out in sectional squares. A recent Thursday found Mishaga daubing at corals and tropical fish on the second floor of the hotel. It’s the near-end of a year-long assignment painting murals on all five floors of the hotel — ceilings included. Each mural stretches 250 feet from one end of the floor to the other, unbroken by hotel room doors, air conditioner units or electrical conduits. The themes segue from tropical sea life on the lower floors to the upper story greenery telling the story of – owner’s choice — the Wizard of Oz. “The book must have been important to Bob when he was growing up,” the artist speculates. No continuity? No problem. Mishaga connects the Oz story to the rest of the murals by dotting the hills with grass huts and palm trees. While he works, hotel maintenance staff and guests come and go from the rooms. Some take pictures. Some want to try painting a little something – he hands them his brush. Others bring him plates of food and cold drinks.He livens up a boring stretch of concrete on the second floor with the giant jaguar shark from “The Life Aquatic,” a film dedicated to the celebrated diver Jacques Cousteau; and for his own amusement, adds a discreet reference to Meatwad, a character from the Aqua Teen Hunger Force cartoon, escaping from an alligator. Does he ever worry his work could one day be lost to weather or redevelopment?